Shorebreak is a marine development and design consulting firm, dedicated to achieving our clients' goals through attention to a balance of form and function. We specialize in the design of planing hull craft, however our experience can help with planning a refit, managing your marine construction project, or adding appeal to your marine product line. Used by manufacturers, custom boat builders, and boat owners, we are available to provide assistance and direction to your project. Good design and planning leads to efficient production and decreased construction costs. Contact us today to discuss how we can help you. 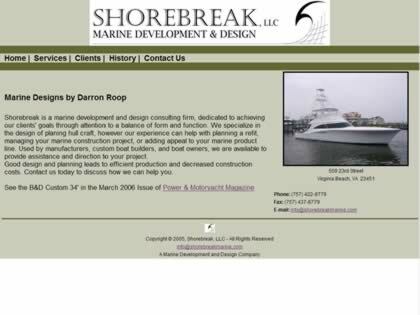 Web Site Snapshot: If available, above is a snapshot of the Shorebreak, LLC web site at http://shorebreakmarine.com as it appeared when this site was added to the directory or last verified. Please Note that Boat Design Net has no involvement with the above web site; all content and images depicted in the above thumbnail are the property and copyright of Shorebreak, LLC unless otherwise noted on that site. Description: Shorebreak is a marine development and design consulting firm, dedicated to achieving our clients' goals through attention to a balance of form and function. We specialize in the design of planing hull craft, however our experience can help with planning a refit, managing your marine construction project, or adding appeal to your marine product line. Used by manufacturers, custom boat builders, and boat owners, we are available to provide assistance and direction to your project. Good design and planning leads to efficient production and decreased construction costs. Contact us today to discuss how we can help you.